The Porsche Tennis Grand Prix will once again be played on the innovative Conipur Pro Clay court in 2014. The surface in the Porsche Arena is state of the art in every respect. At the start it was all very experimental. A world class tournament indoorsand on clay – the WTA had not seen anything like it. Markus Günthardt took the chance and it was not without its risks. 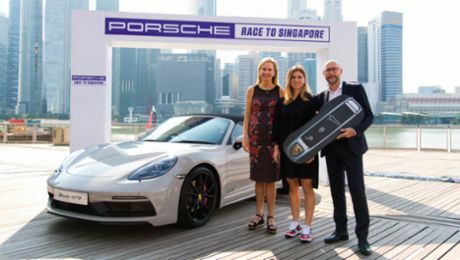 However, the tournament director of the Porsche Tennis Grand Prix was equal to the challenge. At first the world’s best tennis players were a little sceptical when they walked out onto the clay for the first time in 2009 but then they were thrilled by what they found. It meant that the long-established Stuttgart tournament had entered a new era and women’s tennis had a new attraction. The development has continued. Both the players’ and the organisers’ experiences have flowed back into the Conipur Pro Clay court upon which the Porsche Tennis Grand Prix will be played this year. The courts that have been built for the Porsche Tennis Grand Prix consist of a 2.5 centimetre base layer made of crushed tiles which is mixed with a special binding material and covered with finely crushed brick. Almost 40 tons of crushed tiles and four tons of finely crushed brick go into the making of the approximately 800 m² Centre Court. The new system has decisive advantages. A major one is the outstanding playing qualities due to the laser-controlled installation using a special machine guaranteeing a uniformly hard and totally flat surface. It means the sliding and bounce characteristics are consistent all over the court. Annoying bad bounces are virtually non-existent. Particularly important for players: the surface reduces leg strain and therefore injury risk. Since the move to clay, the Porsche Tennis Grand Prix has become an important stopover for the stars en-route to the French Open in Paris. They can prepare for the Grand Slam tournament on the Seine without having to endure any of the uncertainties of the April weather. As for the playing qualities, the surface in the Porsche Arena is almost 100 per cent identical with the courts in Roland Garros. Thanks to MST (Moisture Storage Technology), it maintains a constant moisture level in the indoor arena which in turn means the court remains dust-free and does not have to be watered. MST is simultaneously environmentally-friendly and fully odour-less. Apart from its outstanding playing qualities, the surface also excels as a result of its economic and ecological advantages: the surface can be laid within the space of 24 hours which is an important factor due to the limited event changeover times available in the Porsche Arena. Additionally, it is 100 per cent recyclable and can be used in road construction. The technology therefore conserves the environment and reduces costs. 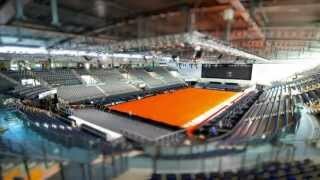 The Porsche Arena and the Schleyer Hall are being prepared for the Porsche Tennis Grand Prix.